Download "Make your next move. 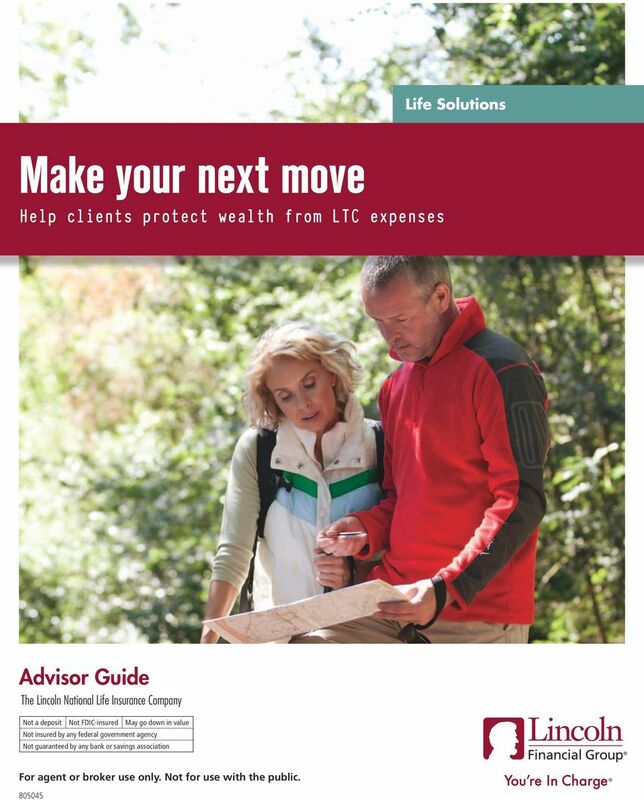 Help clients protect wealth from LTC expenses. Advisor Guide. The Lincoln National Life Insurance Company"
4 Lincoln MoneyGuard II features Policy design Universal life insurance Issue ages Ages (age of last birthday) Premium payment options A choice of flexible payment options of 1 through 10 years Minimum specified amount of death benefit $50,000 Maximum specified amount of death benefit $500,000 with -year LABR $750,000 with 3-year LABR Premium load1 5% of premiums paid. Commissionable. Guaranteed interest rate % Product benefits Deductible period Return of premium benefit There is no deductible or an elimination period to satisfy. Your client will receive benefits as soon as they are eligible. 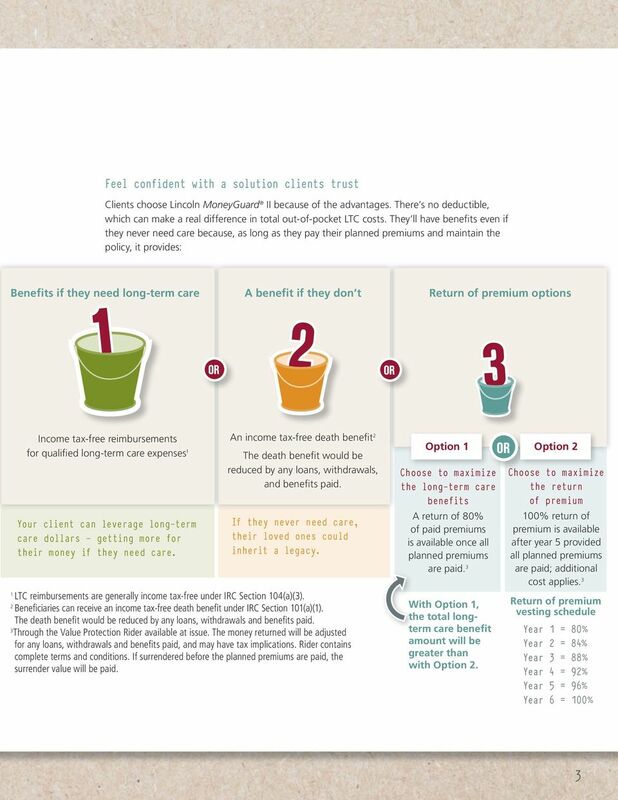 Option 1: Clients who want to maximize their LTC benefits have access to a return of 80% of paid premiums, once all planned premiums are paid. (Included in the cost of the policy.) Option : Clients who want to maximize their return of premium have access to 100% return of premium after year 5 provided all planned premiums are paid; additional cost applies. Option return of premium vesting schedule 1: 80% 4: 9% : 84% 5: 96% 3: 88% 6: 100% Regardless of which return of premium option is selected, if the policy is surrendered before the planned premiums are paid, the surrender value will be paid. 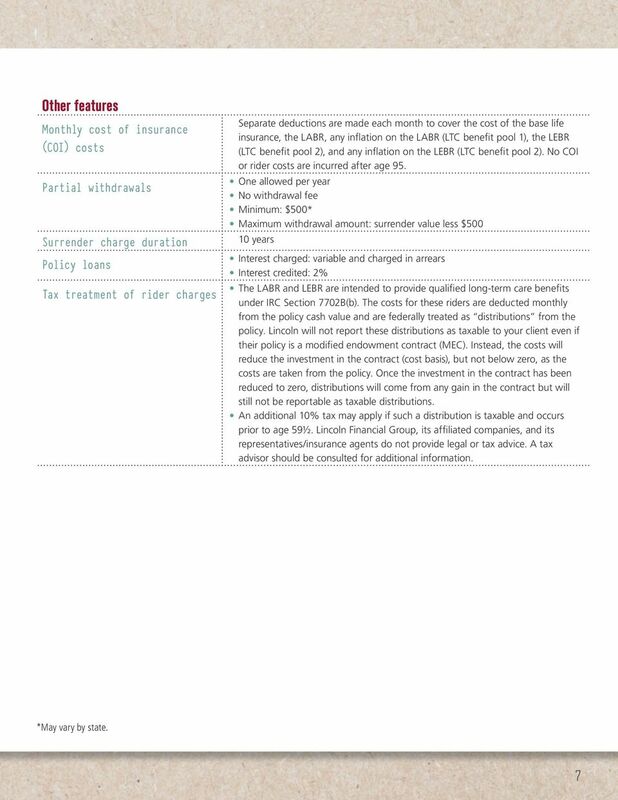 Actual surrender charges are shown in the insured s policy. Amount will be adjusted by any loans, loan interest, loan repayments, withdrawals taken, and claim payments made; and may have tax implications. Return of premium option is selected at the time of purchase. Once chosen, it cannot be changed. This benefit is provided by the Value Protection Rider, available at issue; rider contains complete terms and conditions. Guaranteed benefits 4 All policy charges are guaranteed. All policy benefits are guaranteed if premiums are paid as scheduled. This benefit is provided by the Value Protection Rider, available at issue. 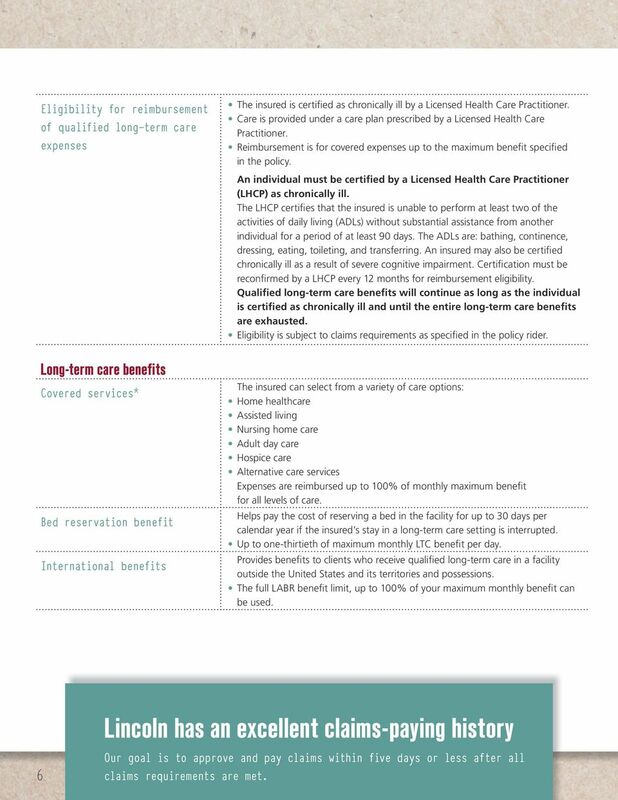 6 Eligibility for reimbursement of qualified long-term care expenses The insured is certified as chronically ill by a Licensed Health Care Practitioner. Care is provided under a care plan prescribed by a Licensed Health Care Practitioner. Reimbursement is for covered expenses up to the maximum benefit specified in the policy. An individual must be certified by a Licensed Health Care Practitioner (LHCP) as chronically ill. The LHCP certifies that the insured is unable to perform at least two of the activities of daily living (ADLs) without substantial assistance from another individual for a period of at least 90 days. The ADLs are: bathing, continence, dressing, eating, toileting, and transferring. An insured may also be certified chronically ill as a result of severe cognitive impairment. Certification must be reconfirmed by a LHCP every 1 months for reimbursement eligibility. Qualified long-term care benefits will continue as long as the individual is certified as chronically ill and until the entire long-term care benefits are exhausted. Eligibility is subject to claims requirements as specified in the policy rider. Long-term care benefits Covered services* The insured can select from a variety of care options: Home healthcare Assisted living Nursing home care Adult day care Hospice care Alternative care services Expenses are reimbursed up to 100% of monthly maximum benefit for all levels of care. Bed reservation benefit Helps pay the cost of reserving a bed in the facility for up to 30 days per calendar year if the insured s stay in a long-term care setting is interrupted. Up to one-thirtieth of maximum monthly LTC benefit per day. International benefits Provides benefits to clients who receive qualified long-term care in a facility outside the United States and its territories and possessions. 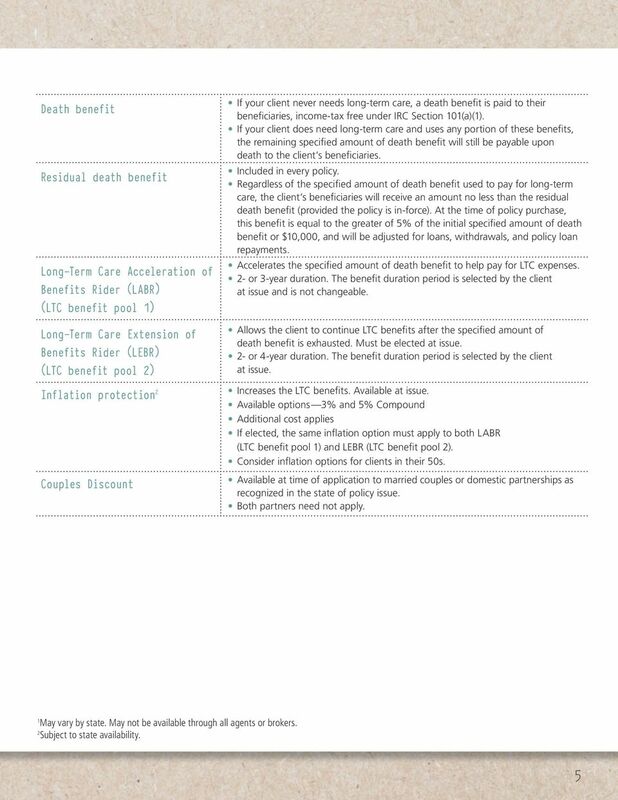 The full LABR benefit limit, up to 100% of your maximum monthly benefit can be used. Lincoln has an excellent claims-paying history 6 Our goal is to approve and pay claims within five days or less after all claims requirements are met. 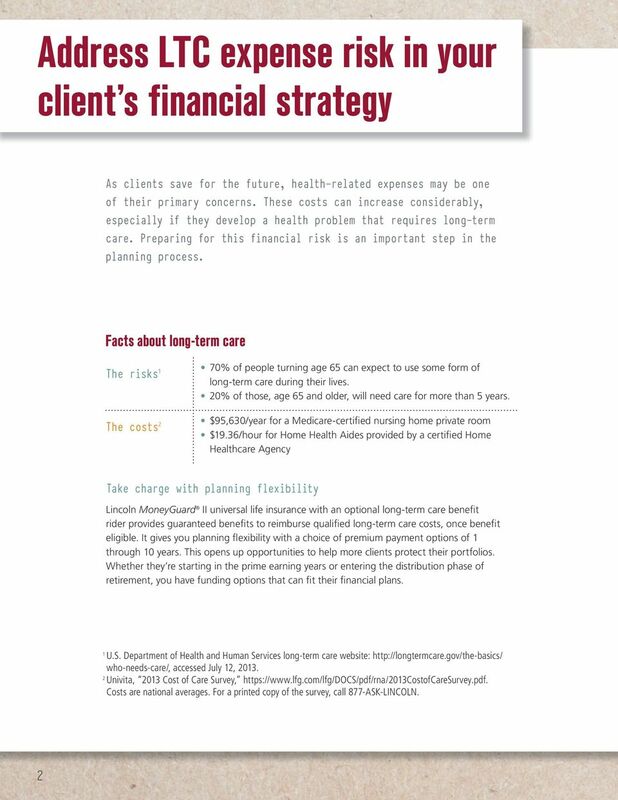 8 Make LTC planning part of your client s financial strategy. For more information about planning flexibility with Lincoln MoneyGuard II, contact your Lincoln representative. Not a deposit Not FDIC-insured Not insured by any federal government agency Not guaranteed by any bank or savings association May go down in value 014 Lincoln National Corporation LincolnFinancial.com Lincoln Financial Group is the marketing name for Lincoln National Corporation and its affiliates. Affiliates are separately responsible for their own financial and contractual obligations. LCN ECG 1/14 Z01 Order code: MGR-ADV-BRC001 This material was prepared to support the promotion and marketing of investment and insurance products. Lincoln Financial Group affiliates, their distributors, and their respective employees, representatives, and/or insurance agents do not provide tax, accounting, or legal advice. Any tax statements contained herein were not intended or written to be used, and cannot be used, for the purpose of avoiding U.S. federal, state, or local tax penalties. Please consult your own independent advisor as to any tax, accounting, or legal statements made herein. Lincoln MoneyGuard II is a universal life insurance policy with a Long-Term Care Acceleration of Benefits Rider (LABR) that accelerates the specified amount of death benefit to pay for covered long-term care expenses. Long-Term Care Extension of Benefits Rider (LEBR) is available to continue long-term care benefit payments after the entire specified amount of death benefit has been paid. 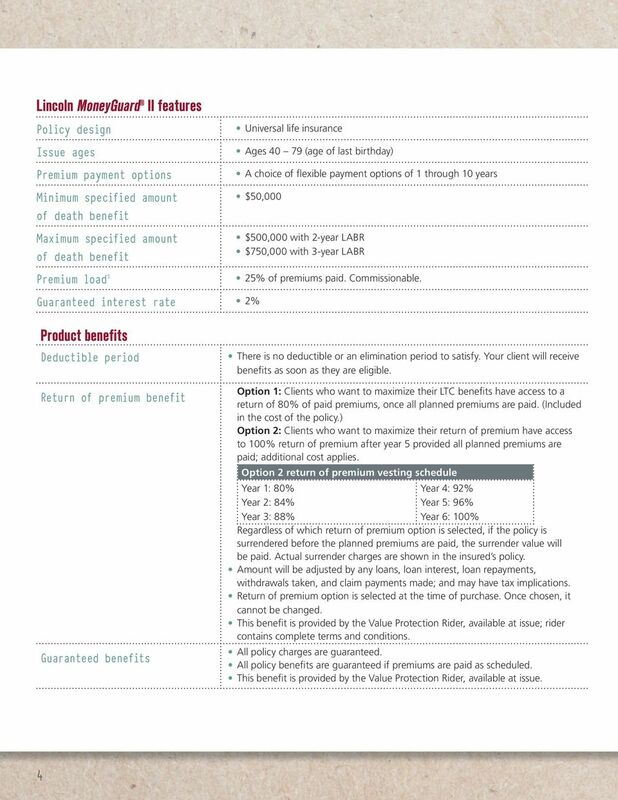 The return of premium options are offered through the Value Protection Rider (VPR) available at issue; Base option (1) is included in the policy cost; Graded option () is available at an additional cost. Any additional surrender benefit provided will be adjusted by any loans/loan interest/loan repayments, withdrawals taken, and claim payments made; and may have tax implications. The cost of riders will be deducted monthly from the policy cash value. The insurance policy and riders have limitations, exclusions, and/ or reductions. Additionally, long-term care benefit riders may not cover all costs associated with longterm care costs incurred by the insured during the coverage period. All contract provisions, including limitations and exclusions, should be carefully reviewed by the owner. 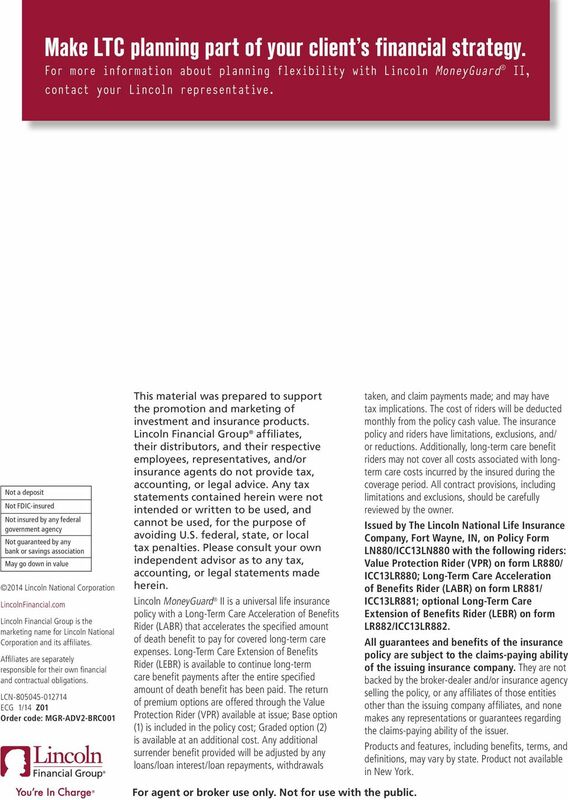 Issued by The Lincoln National Life Insurance Company, Fort Wayne, IN, on Policy Form LN880/ICC13LN880 with the following riders: Value Protection Rider (VPR) on form LR880/ ICC13LR880; Long-Term Care Acceleration of Benefits Rider (LABR) on form LR881/ ICC13LR881; optional Long-Term Care Extension of Benefits Rider (LEBR) on form LR88/ICC13LR88. All guarantees and benefits of the insurance policy are subject to the claims-paying ability of the issuing insurance company. They are not backed by the broker-dealer and/or insurance agency selling the policy, or any affiliates of those entities other than the issuing company affiliates, and none makes any representations or guarantees regarding the claims-paying ability of the issuer. Products and features, including benefits, terms, and definitions, may vary by state. Product not available in New York. For agent or broker use only. Not for use with the public.